. Published on Wednesday, October 24, 2018 . Each year, the happiest place on earth gets a little bit happier… and yes, we are talking about Halloween Time at Disneyland! In addition to pumpkins everywhere you glance, orange and yellow banners waving off the light posts and The Nightmare Before Christmas Haunted Mansion overlay, the Disneyland Resort (DLR) and Disney California Adventure (DCA) have stepped up their game with an array of Halloween-themed treats and snacks to keep you going through your day. Here we have compiled all our favorite limited edition treats that you can enjoy at the parks this October. Pumpkin Spice Latte, step aside. 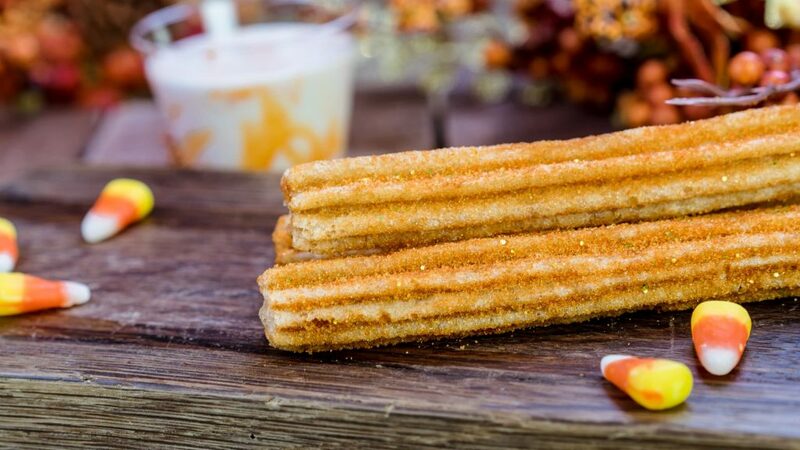 Yes, Disney just mashed together two of our favorite things: pumpkin spice and churros. If you thought that a Disneyland churro was the best sweet treat to snag at the park, you simply can’t let this spin on the classic go without tasting. Drenched in gold flecks, orange sugar, cinnamon and little ghost sequins (that we question are even edible), this crunchy and doughy churro is a MUST this Halloween season. We can’t let the churros go to rest that easy… they have been a staple at the Disney parks for years! Imagine those perfect churros, a la mode. You don’t have to imagine, because this perfectly concocted sundae exists! With two mini churros nestled into scoops of creamy cookie dough ice cream, and topped with whipped cream and caramel, the highlight of this sundae for us is the streaks of cookie butter throughout the dish. It is definitely not a light treat, but that makes it perfect for sharing! Churros aren’t the only doughy, sweet treat you can enjoy at the parks! Disneyland is also renowned for their Mickey-shaped beignets, which are small, deep-fried pastries piled with powdered sugar. Needless to say, they are incredibly delicious. While the regular beignets are sold in the park year-round, Halloween Time strikes again with the pumpkin takeover. These fluffy, pumpkin-y treats will melt in your mouth and leave you wanting more. If all these cinnamon, sugary and pumpkin-y flavors are too much for you, this rich and fruity dessert may just hit the spot. This macaron consists of two shimmering black macaron cookies with charcoal cherry ice cream covered with raspberry sauce and popping candy wedged between them. There are a lot of flavors going on here, but this treat’s flavorful notes and colors all compliment each other to make a visually pleasing, dynamic snack. Which Halloween treat are you dying to try? Let us know by using the hashtag #CampusCropChat on Facebook, Twitter and Instagram, and don’t forget to follow us on Snapchat @asicpp!